The Tokyo Gas Group has practiced effective and efficient environmental management under the leadership of top management since establishing its Group-wide environmental management system (EMS) in 2005 to comply with the ISO 14001. In fiscal 2017, we started operating an EMS that meets the revised ISO 14001:2015. Precisely following the PDCA cycle in the EMS allows us to ensure legal compliance and reduce environmental impact, preserve biodiversity and strengthen environmental partnerships, making our environmental protection activities both systematic and substantive. 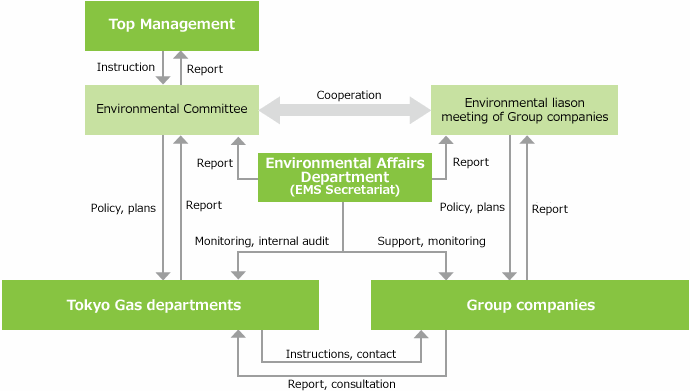 We operate Group company environment management systems, as described below, to strengthen the Tokyo Gas Group’s environmental governance and steadily and efficiently pursue environmental management as a concerted effort. Additionally, 95% of all EMS’s in the Group have obtained ISO 14001 certification for sales. Objective: The committee is stipulated in environmental management rules. It primarily discusses the Group’s environmental policy and environmental protection plans for their concerted and effective implementation. Tokyo Gas Living Line Co., Ltd.
Tokyo Gas Remodeling Co., Ltd.
Tokyo Gas Lease Co., Ltd.
Tokyo Gas Customer Support Co., Ltd.
Tokyo Gas Lifeval Nishi-Ota Co., Ltd.
Tokyo Gas Lifeval Chiba Co., Ltd.
Tokyo Gas Yamanashi Co., Ltd.
Tokyo Gas Real Estate Holdings Co., Ltd.
Tokyo Gas Site Development Co., Ltd.
Tokyo Gas Living Holdings Co.,Ltd. Tokyo Gas Chemicals Co., Ltd.
Tokyo Oxygen And Nitrogen Co., Ltd.
Tokyo Rare Gases Co., Ltd.
Park Tower Hotel Co., Ltd.
Tokyo Gas Energy Co., Ltd.
Tokyo Auto Gas Co., Ltd.
*2 Included in the EMS activities of Capty Co., Ltd.
*3 Included in the EMS activities of Tokyo Gas Co., Ltd.
*4 ISO registration covers business activities related to a building rental at Shinjuku Park Tower (excluding the hotel). *5 ISO registration covers the head office and management division of the Park Tower. The internal audit in fiscal 2017 found that the EMS’s in all our sections complied with the requirements specified by the ISO 14001: 2015 and that the EMS’s were effectively operated. The Group was not cited for any violations or fines with respect to environmental laws and regulations in fiscal 2017. While the Group uses only small quantities of hazardous chemicals in gas production and supply processes, it will continue to manage them effectively and in accordance with prevailing laws and regulations and reduce their release. The Group handled the following amounts of chemicals subject to reporting requirements under the pollutant release and transfer register law* in fiscal 2017. We had no subsidiaries for which reports were legally required in fiscal 2017. Tokyo Gas inspected products specified by the Act on Rational Use and Proper Management of Fluorocarbons (commercial air conditioners, refrigerators and freezers) that it manages and is legally required to check as of the enforcement of the law in April 2015. In fiscal 2017, we submitted a report to the competent ministries because the leakage calculated by the specified formula exceeded the 1,000 t-CO2 threshold for a subsidiary, although Tokyo Gas’s leakage was below this level. As a registered operator for fluorocarbon refill and recovery, we collected and appropriately handled fluorocarbons that were removed during inspections and maintenance of products with global warming potential (GWP). The electric chillers we have introduced over the past several years use low-GWP fluorocarbons, and we continue to adopt low-GWP chillers. Refill, Recovery and Destruction as a Registered Fluorocarbon Refill and Recovery Operator. In fiscal 2017, we did not engage in any refill or recovery as a registered operator for fluorocarbon refill and recovery. 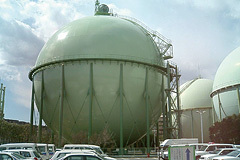 Tokyo Gas has since fiscal 1991 strived to reduce volatile organic compounds (VOCs), which are released from such operations as painting gas holders. Also, we have recently shifted to a painting method that uses weak solvent paint (a low-VOC painting method) and aim to reduce VOC emissions further. We appropriately store and manage polychlorinated biphenyl (PCB)-containing hazardous waste in our possession and process it by the required deadlines in accordance with the Act on Special Measures concerning Promotion of Proper Treatment of PCB Wastes. In fiscal 2017, we processed no such waste. In our business operations we place a high priority on responding positively to environmental issues. We assess potential environmental risks to business activities and appropriately mitigate them. We also review and disclose information on environmentally hazardous substances and pollution from our operations in the past and are taking swift steps to deal with them. If a serious environmental risk materializes, we will follow the Emergency Response Organization Regulations and swiftly implement measures to prevent a recurrence in light of emergency steps or risk levels and ensure that we avoid any secondary risks. The Group recognizes concerns that climate change may affect our business activities in the following ways and is responding appropriately. To reduce greenhouse gas emissions, which are associated with rising global temperatures, the Group has drawn up the Guidelines for Global Warming Countermeasures. Also, it is working to reduce emissions from city gas production facilities, power plants, district heating and cooling centers and offices as well as from customer sites, which account for the largest share of CO2 emissions in the LNG value chain. Our efforts to combat climate change also include the development and dissemination of low-carbon systems. Climate change-induced disasters, such as localized torrential downpours and storm surges, may damage city gas production facilities and delay or halt LNG transport. We have formulated disaster preparedness plans at production, supply and other facilities as well as business continuity plans (BCPs) to prepare for a major accident, large-scale power outage or outbreak of disease caused by a major typhoon. In addition, we believe that diversifying the suppliers of LNG, which is used to produce city gas, will help minimize the risk of supply chain disruption when any single source is affected by a natural disaster. Regulations such as emissions trading and carbon taxes may rein in the use of fossil fuels. Nevertheless, we are committed to contributing to the creation of a low-carbon society by pushing for a shift from oil and coal to natural gas, the cleanest fossil fuel, expanding the use of highly energy-efficient appliances and systems such as combined heat and power (CHP) systems*, promoting renewable energy use, and making more efforts to build smart energy networks. The Group addresses water as a business risk and manages its use of tap water, industrial water and seawater, conserves fresh water and controls water discharge. We have taken steps to protect LNG terminals and gas pipeline-related facilities from flooding caused by localized torrential downpours and storm surges, which are linked to climate change. In the face of increasing water risks, we carry out comprehensive assessments and analyses on current risks (water demand, flooding, public health and biodiversity) and future risks (effects of climate change and securing water resources). Since fiscal 2016, we have used such international indicators as the WWF-DEG Water Risk Filter (Map) in addition to the WRI Aqueduct and WWF-DEG Water Risk Filter to supplement each other. We conducted assessments and analyses at eight LNG terminals and overseas bases in fiscal 2017 and found no problems. Finding it necessary to collect more information on environmental risks on the part of suppliers, we plan to distribute questionnaires to them in addition to our own in-house survey. In fiscal 2017, we used a total of 5,180 thousand m3 of freshwater at LNG terminals where city gas is produced, district heating and cooling centers, power plants using LNG, offices and other facilities in Japan. We are working to reduce process water consumption at LNG terminals, district heating and cooling centers and power plants through such means as optimizing boiler operation, reducing steam loss and replacing chillers with more efficient electric turbo types. To reduce our use of tap water at offices and similar facilities, we are increasing our use of recycled water, installing water-saving toilets and encouraging employees to conserve water. Regarding waste water, we measure discharges and manage water quality through the use of indicators, such as pH, COD*, and nitrogen and phosphorus concentrations, in accordance with national laws and regulations, local government ordinances, agreements and other rules. We use seawater mainly at LNG terminals and power stations as a heat source and then return the entire amount to the sea. Since fiscal 1999, we have been conducting soil tests and groundwater surveys on land currently or previously owned by Tokyo Gas, such as former plant sites, with potential soil pollution and taking the necessary measures when pollution has been confirmed. We proactively disclosed information through reports to relevant authorities, explanations to nearby residents and press releases. Depending on specific circumstances, we have paved over or excavated and removed contaminated soil to prevent its dispersal. Also, we have installed impermeable walls or pumped out contaminated underground water to stop it from spreading. We continue to control soil pollution, reporting excavation work to authorities and conducting surveys in accordance with the Soil Contamination Countermeasures Act and relevant ordinances. Furthermore, we ensure that contaminated dirt is not dispersed and that excavated soil is handled properly. With the revision of the act in 2010, we have taken action to address soil pollution caused by natural factors or landfill with the same commitment as legally mandated interventions for pollution associated with our business operations. Our environmental education comprises stratified training aimed at deepening the basic understanding of environmental issues as well as our Group’s environmental measures and EMS education for workplace leaders to gain the knowledge they need for environmental management. Additionally, we have offered eco-driving training to develop skills for green and safe driving, a class for eco-cooking instructors to learn eco-friendly diets, and other practical programs that are helpful in reducing environmental impact and facilitating environmental communication. We encourage employees to learn at their convenience through the corporate intranet about climate change-related issues and developments in and out of the company and considerations for handling waste. 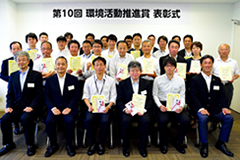 We recognize workplaces and partner companies for efforts such as reducing environmental impact, increasing brand value and contributing to communities as models for the Tokyo Gas Group. We strive to invigorate and improve the entire Group by sharing best practices. Under the commendation system launched in fiscal 1999, we granted awards for 10 of 28 applications (3 eco-friendly business promotion awards, 4 eco-office activity awards, and 3 eco-citizen activity awards). Award winners at the fiscal 2017 presentation ceremony. 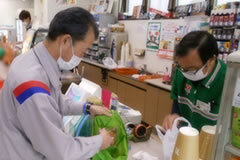 The eco-citizen activity award recognizes efforts to beautify and clean up the area around the Hiranuma office. We have conducted employee surveys since fiscal 2001 to ascertain their environment awareness, environmental behavior and understanding of our environmental activities, and we use the results as basic information for formulating the plans for the following year’s activities. The fiscal 2016 survey gathered 9,890 valid answers for a response rate of 58% and found that about 90% of the respondents had expressed interest in environmental issues. We make use of survey results to reinforce measures to raise the environmental awareness of the Group employees and improve educational programs.